The best gospel-informed jazz I heard in the past few days was not from the Ramsey Lewis Trio when they appeared at Ted Mann Concert Hall Saturday night, which is not to discredit the NEA Jazz Legend or his very able cohorts. Their efforts were swinging and at various points the audience was appropriately swaying, even without the addition of the scheduled Hammond B-3, which was unfortunately swapped for a dysfunctional electronic keyboard. Would-have-been organist William Kilgore was left with little to do. No, the most passionate purveyor of America’s indigenous music was Jamaican Monty Alexander and his equally swinging partners, bassist Hassan Shakur and drummer George Fludas, on stage at the Dakota. Pianist Alexander stopped here in 2005 while touring in support of his second Bob Marley project, Concrete Jungle. There might be advantages (at least to the audience) when an artist tours without the immediate expectation of promoting the latest release. While Alexander is the interpreter nonpareil of Marley in a jazz context, he is at least equally in his element, and at the top of the periodic chart, when it comes to good ol’ American bop and blues, his trio’s simpatico artistry in the vein of Nat Cole and Oscar Peterson. My friend Mike noted on the way out that “we won’t likely come this close to Oscar Peterson again.” Alexander certainly has the same joyful and dazzling approach rooted in stride and swing, but with a gentler touch than the late OP and an ever-present tendency to slip into a Caribbean rhythm in any situation. In fact the late set last night was all about rhythm. Regardless of the fare, be it Alexander originals, a medley of hard bop favorites (“Angel Eyes,” “Work Song” and “Fly Me to the Moon”), a Basie blues (“Little Darlin”) or Marley himself (“Running Away”), the trio reinvented the rhythm, turning blues into reggae, swing into blues. Monty and company brought us the world, from the American South to Jamaica to rhythms that might originate east of the Nile, but joy was the constant, eye contact and smiles communicating as much as flourishes from the keyboard or thunder from the trapset or glissando from the bass. 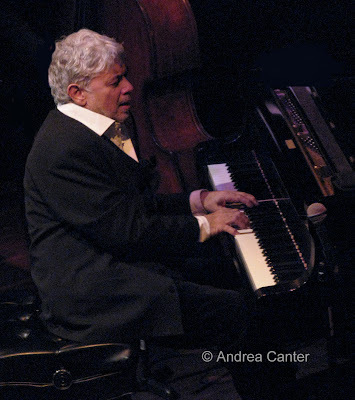 Straight-ahead seldom sounds simultaneously so modern and so rooted in our history as it did throughout the set as the Monty Alexander Trio filled the night with (mostly) familiar melodies set aglow with elegant improvisations that sang out from here to Kingston. The Jamaican bop preacher reigned in the Kingdom of Jazz. Hallelujah!